Jaguar Land Rover is the UK's largest automotive manufacturer, built around two iconic British car brands: Land Rover, the world’s leading manufacturer of premium all-wheel- drive vehicles; and Jaguar, one of the world’s premier luxury sports saloon and sports car marques. The company employs almost 38,000 people globally and supports around 275,000 more through our retailers, suppliers and local businesses. Manufacturing is centred in the UK, with additional plants in China, Brazil and India. 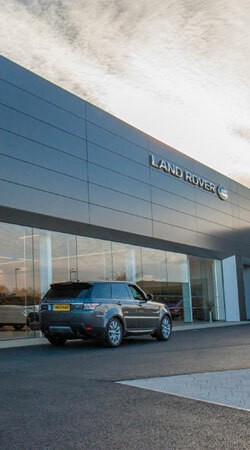 At Jaguar Land Rover we are driven by a desire to create class-leading products that deliver great customer experiences. The largest investor in R&D in the UK manufacturing sector, we have invested £12 billion in the last five years and in the current year alone will spend over £3 billion on new product creation and capital expenditure. Last year Jaguar Land Rover sold 487,065 vehicles in 160 countries, with more than 80% of our vehicles produced in the UK being sold abroad. The origins of Jaguar can be traced back to a company that began by making motorcycle sidecars in 1922. The Swallow Sidecar Company later started building automobiles and moved to Coventry, switching its name to Jaguar after the Second World War. It produced premium saloons and sports cars, including the legendary XK120. Around this time, Rover started to develop a new all-terrain vehicle, inspired by the American Jeep. Lightweight and rustproof, the first Land Rover was clad in aluminium alloy, due to the post-war steel shortage, and cost £450. It introduced 4x4 capabilities to road cars and was soon adopted by the military as well. Adding to Jaguar’s reputation was its motorsport success in the 1950s, winning the Le Mans 24 Hours race twice with a C-type – in 1951 and again in 1953 – and then with a D-type in 1955, 1956 and 1957. In 1961, the company launched what became perhaps the most iconic sports car of all time, the E-type. In 1968 it merged with BMC (British Motor Corporation), which later became part of British Leyland and included Rover. With an increasing demand for recreational off-roaders, the Range Rover made its debut in 1970. So popular was the new car that British Leyland made Land Rover a standalone company in 1978. Very little about the first Range Rover was altered over the years – 1981 introduced a four-door, while a diesel arrived in 1986. As the Range Rover became seen as more upmarket, the Land Rover Discovery was launched in 1988 as a third model in the range. After splitting from British Leyland, Jaguar became independent again in the 1980s, before being purchased by Ford in 1989. Land Rover, meanwhile, was bought by BMW in 1994, which expanded the range further by introducing the Freelander. It then joined Jaguar under Ford in 2000, with the two companies becoming closely linked, sharing engineering knowledge and facilities. In 2008, the two were bought by Tata Motors, India’s largest automobile manufacturer, and officially joined together as one company in 2013. Sales and profits have risen year on year, with more exciting chapters in the histories of these two brands still to be written. Individually, Jaguar and Land Rover may be iconic brands – each with distinctive hallmarks that make them admired and desired throughout the world. Together, though, they form one incredible business to experience and grow with and one unique organisational approach. We call this approach the Jaguar Land Rover Way. It sums up how we do business, wherever we do business. And it is something we all live and breathe every day. The approach is based on a set of core values. These values help us create and manufacture premium vehicles in a sustainable way. They involve us working together with integrity and understanding, and striving to achieve excellence in everything we do. We want to deliver more great products, faster than we have ever done before. We want to be leaders in the field of environmental innovation. We want to be sure our customers always come first. These are the three great passions we all share. Together, they form our mission. One of the things that makes our business truly special is our employees. You will be surrounded by engaged and passionate people who genuinely care about the work they do and about the products they help to create. As we continue to expand our global footprint, it is this working culture that will give us the edge.